Continuing from my last post about some of my hits and misses in the garden, here's a hit in my opinion. This is Monarda 'Grand Marshall', a fuschia-pink bee balm I planted last fall. The color becomes more intense when sunlight hits it. Very dark fuschia. 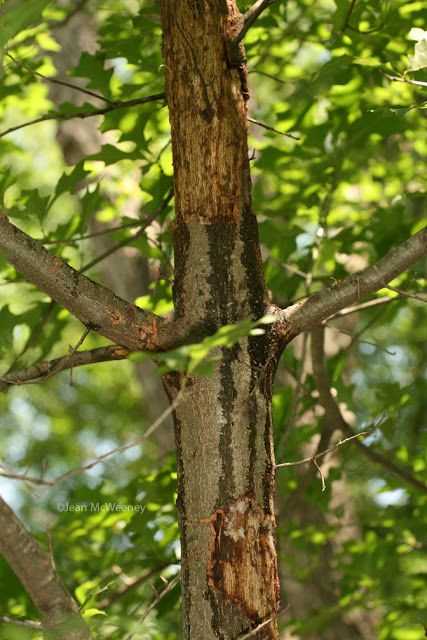 I'm in complete shock about what's happening to one of my newer oak trees - it's possible that canker has infected the whole tree. I'm still awaiting the final diagnosis from the extension agent, but it doesn't look good. This tree has been growing really well since we had it planted about four years ago. It grew very, very quickly and was planted as a future replacement tree for an old pecan that is on its last legs. We think it's a red oak (that's what I asked for but the guy who brought it and planted it couldn't remember the exact species). I'm very curious what may have caused this. It shouldn't be drought stress since it's located where it gets water from the sprinkler system (and I try to water deeply). I sure hate to lose a tree, especially this one which had so much promise. Maybe the fact that it grew so quickly, from about 8 feet to almost 30 feet in four years, should tell me something. Most oak trees don't normally grow that fast. On to something a little less anxiety producing. 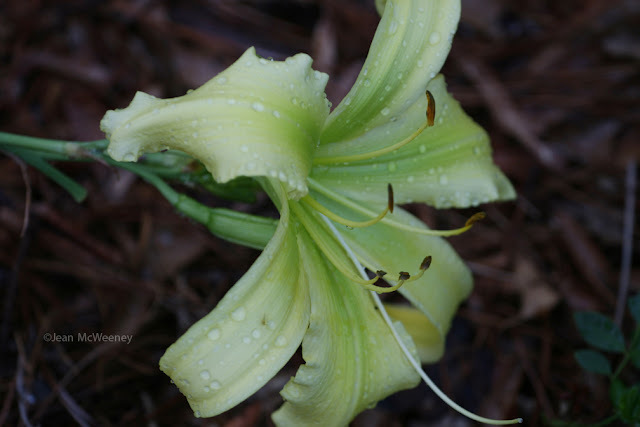 I bought a couple of 'Windmill Yellow' daylilies last weekend at Joy Walk Daylily farm outside of Ruston. Joy Walk is now getting famous for winning best in show (or something like that) at the national daylily shows with this particular bloomer. So maybe I have a famous daylily now?? The bloom is huge, much bigger than my hand. I hope it does well. 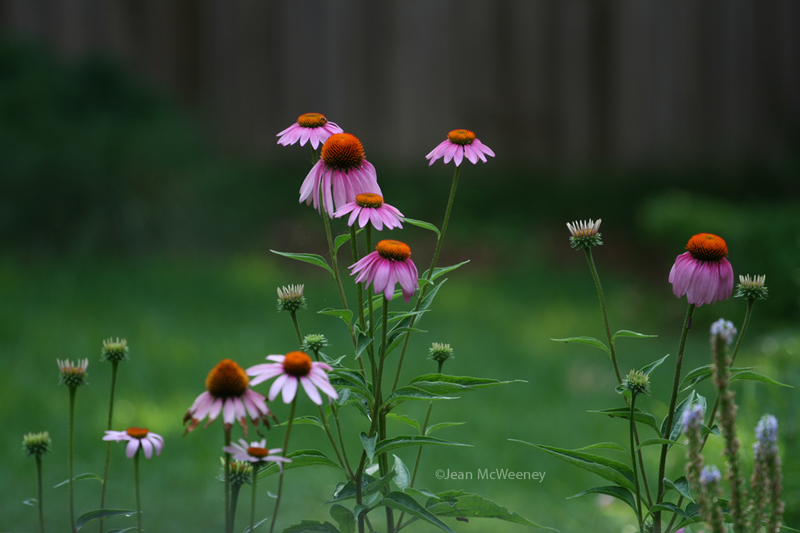 And one last June "hit" in my garden, the purple coneflowers are starting to bloom. I'm so sorry about the oak tree, Jean. That looks scary bad. If it were a thin barked species I would say it's sun scald. But living in Louisiana I doubt it. Its too high for deer antler damage. I had some red oaks in Oklahoma freeze crack before after the winter. Did it go into winter growing actively? Greggo - I looked back at photos to see what the tree was doing around winter. Like most of my trees, it was wearing its fall colors into Christmas. I have a photo of it showing a few red leaves still hanging on New Year's Day. A month later it was covered in ice. We had some prolonged low temps (for us) in Jan and early Feb. If it cracked afterwards, then some bacterium probably invaded it later. It's funny that all the missing bark starts above the lowest branches. btw, I enjoyed perusing your blog! Jean, have you tried Jacob Cline monarda from High Country Gardens? It makes a deep red flower and its really pretty. Growing well in my garden, hopefully it will make it through the summer. Good luck with your tree! I've been fighting dogwood borers and thought I was going to lose my dogwood last summer. I was so relieved when the arborist said it could be saved. I think orange and purple look so cool together I plant them as a combo. :o) So I don't think they'll clash at all!! Geez, that's very worrisome about the tree. I hope you can save it, especially since it sounds like it has been a great addition to the garden up to now. Too bad about the tree - but you have that gorgeous daylily and the bee balm for consolation. I love them both. I'm sorry you are losing your tree. I'll not offer any theories, just my sympathy. It is a terrible loss. Love the Monarda. Any powdery mildew in sight? That Mondarda is beautiful...I'll have to remember it...I wonder how its mildew resistance is? So sorry to hear about your Oak tree...that's never easy. So sad about your oak tree, but it is strange how quickly it grew. I love your fuschia bee balm; mine is a much paler color and I often wish it were darker like yours. I've learned to enjoy clashing colors, though--the orange acanthus will just draw everyone's eye to this corner of your garden. 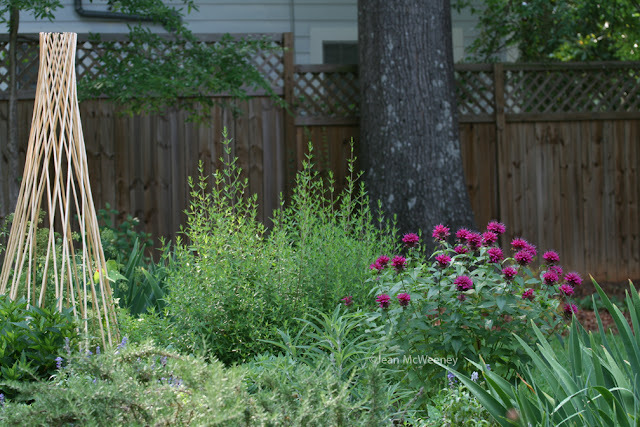 I LOVE your monarda! I want a bunch of them. And don't worry about the color clash with anisacanthus: I do it all the time. Actually, in your case, I think this would be lovely. 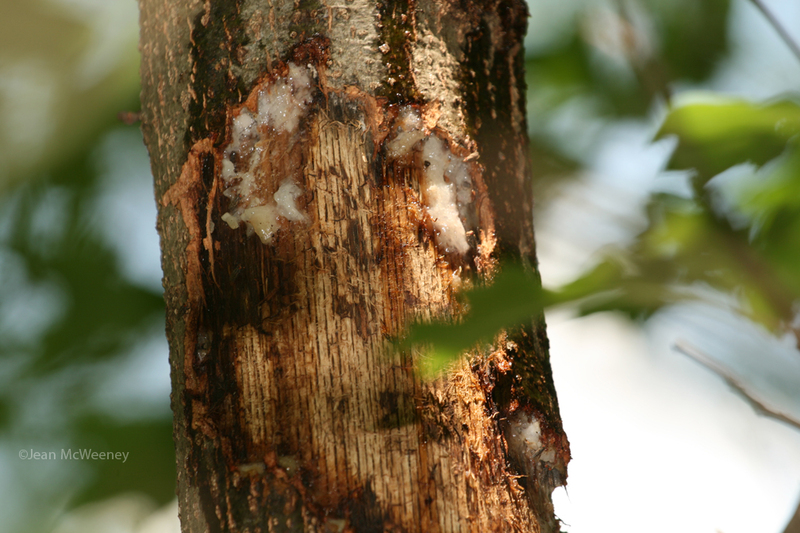 So sorry about the tree: let us know what the Extension agent says. And ooh, that pale daylily; must have some. It's bad enough when an old tree on its last legs doesn't live, but this is a new new one planted by you - sorry Jean. I love that Windmill Yellow daylily! If it's not famous yet - it should be! Mary, I haven't tried 'Jacob Cline' (in fact, this is only the second time I've tried monarda; first time it grew and grew but didn't bloom). But I did get 'Grand Marshall' from High Country Gardens and am very happy with it. Jim and Scott - no mildew in sight for the monarda. That's saying a lot since I have a couple other plants in the same raised bed who DO have some powdery mildew now. If the monarda is still blooming by the time the flame acanthus does, I'll be sure to take a photo of the two together. Then we'll all see if there's a clash! 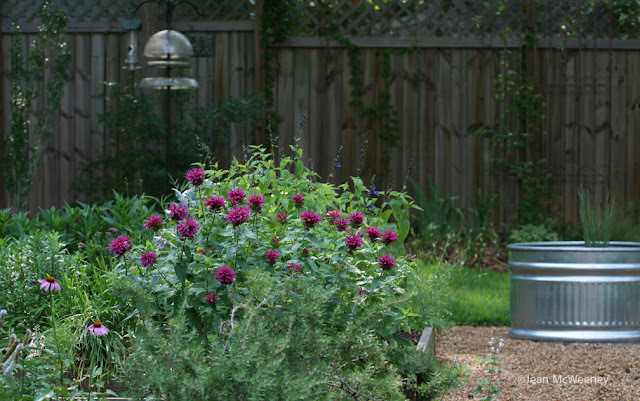 Your monarda looks great. I had good success with Raspberry Wine for a couple of years. We have M. didyma in flower right now (with slight color-clash overlap), so I'm planning to move it below the house in a new bed, as soon as the lower level sunroom is finished! P.S. That's a great photo of the purple coneflowers. Sorry about your troubles, but like Dee I think purple and orange could be vividly beautiful together! You have stellar hits and then Mother Nature whacks you with a punch or two so you don't get to complacent. This happens to us all. Love the shots. I love daylilies and that one is quite lovely; very subtle. have never seen that happen to an oak tree so will be interested in your further reports. These look lovely. Thanks for sharing them with us.